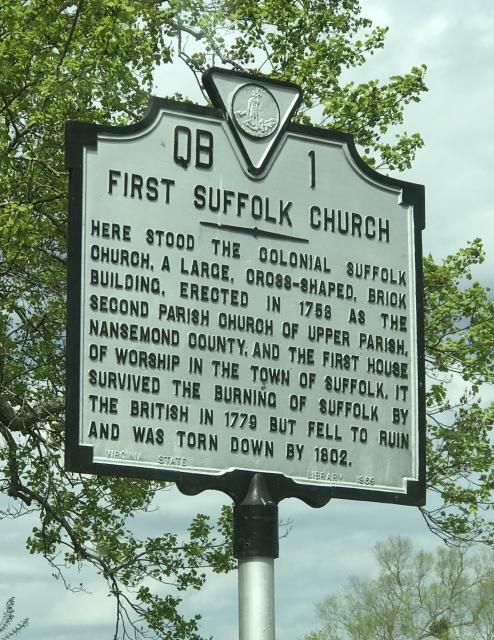 Here stood the Colonial Suffolk Church, a large, cross-shaped, brick building, erected in 1753 as the second parish church of Upper Parish, Nansemond County, and the first house of worship in the town of Suffolk. It survived the burning of Suffolk by the British in 1779 but fell to ruin and was torn down by 1802. This marker can also be identified by its HM code. You can use the hashtag #HM1GE3 in tweets, and any other place where you might refer to this marker, including when searching on this site.